Are your kids into science? Give them a chance to try out some simple science experiments with this “lab in a box” set up. Do You Have Too Many Science Kits? My daughter was always interested in science, and over years we bought and received as presents several science kits. To be honest, many of them looked terrific in their bright boxes but contained experiments that could be easily procured out of our kitchen cabinet. Our favorite kit was this Lab in a Bag kit and it was not because of the chemicals that it contained, but because of the thick plastic test tubes with a rack. Strangely, it doesn’t seem to be easy to get just test tubes with a rack that are good for little hands. Learning Resources has this set of jumbo tubes, but considering a small difference in price, Lab in a Bag seems like a better deal. In addition to Lab in a Bag, we accumulated bits and bobs from other science kits and Smarty’s after school Mad Science handouts. Eventually we consolidated all electrical components in one box, and all chemistry components in another box that we call our “Lab in a Box”. Protective eye gear – we encourage our daughter to get used to wearing it. Strong smelling spices for “potions” – ground cloves, cinnamon sticks, etc. A science book – we have 52 Amazing Science Experiments that comes on small cards and doesn’t take a lot of space. The concept of lab-in-a-box assumes that your little scientists have graduated from “put everything in your mouth” class and know how to keep their science materials away from pets and younger siblings. In fact, I strongly recommend this “lab-in-a-box” kit for kids over 7 or to younger kids with adult supervision. What would you add to our lab-in-a-box? More Science Ideas for Kids? 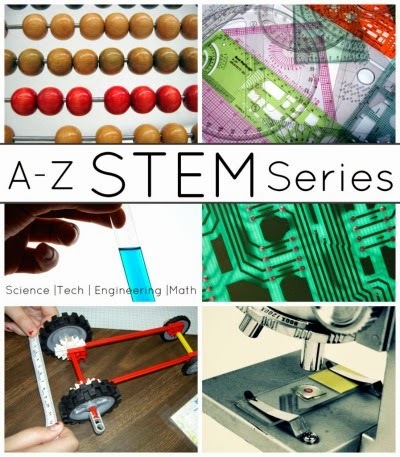 This post was written as part of A-Z of STEM series. Check out the landing page for amazing STEM ideas from creative kid bloggers. Follow my Science Pinterest board Follow Natalie Planet Smarty Pants's board Science on Pinterest. Batman would love this. seriously love it. We've never purchased a lab in box but over time we have collected science lab items just like you. The more experiments we do the more bits we collect. This is such a great idea! Thanks for linking up at the Thoughtful Spot Weekly Blog Hop! We hope you join us next week! I love the idea of setting up a lab box, but I would have loved one as a child. This would make a super unique present too. I made one of these years ago for my son Sam when he was into the whole lab experimenting thing. I love how you have laid out this post.